i just bought a chinese elm and it was raised in mississippi for 15 years as an outside tree. i am just wondering if after the leaves fall off if it will be ok in a dark garage if the temp stayes between 32 F and 45F ? That is exactly where to put it, but don't go by when the leaves fall off. In Buffalo, leave it outside until just before Thanksgiving, or when night temperatures go below 28 F. There is a very active Buffalo Bonsai Society. Be sure to join them. i have, we are going to hollow creek on the 21 of this month for a picnic and demo. ive only been to 1 meeting but im sooooooooo excited to get to know these wonderful people. oh and thank you very much for the advise, i hope to be in touch with you seeing as you are in NY also. i have 4 more trees i will get pictures to show. how about you, do you have alot of trees? sublime716 wrote: i hope to be in touch with you seeing as you are in NY also. i have 4 more trees i will get pictures to show. how about you, do you have alot of trees? 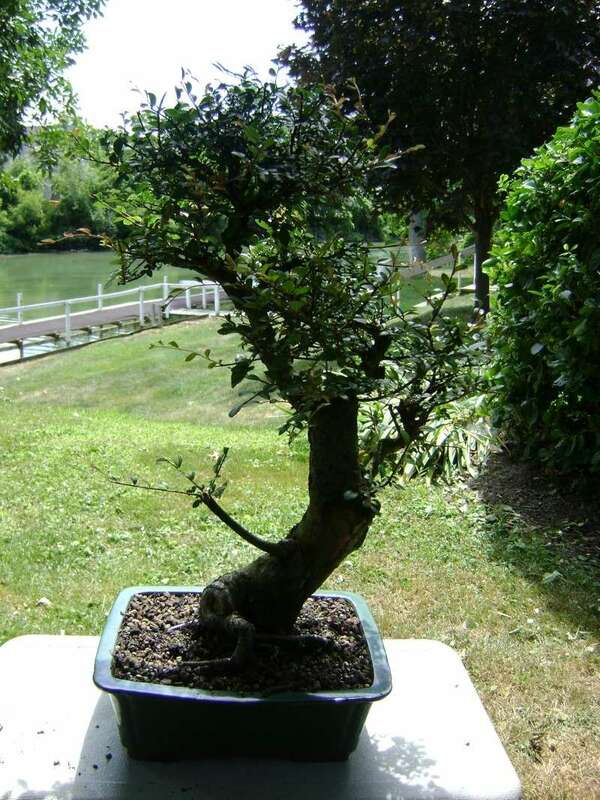 I have about 23 trees, but only half of those are fit to be called bonsai. would love to come out to see the show, but that so happens to be the weekend im getting married. (i think she would be mad). i love the link for the 2nd national bonsai show. my soon to be wife and i were lucky enuff to be able to go on that sunday and see all those BEAUTIFUL trees. by the way im sure all your trees are beautiful. as per moyogijohn i will post my elm again. ya its ALOT bigger than i thought (about28 inches). its going on a trip with me to hollow creek on the 21 st for some professional opinions. 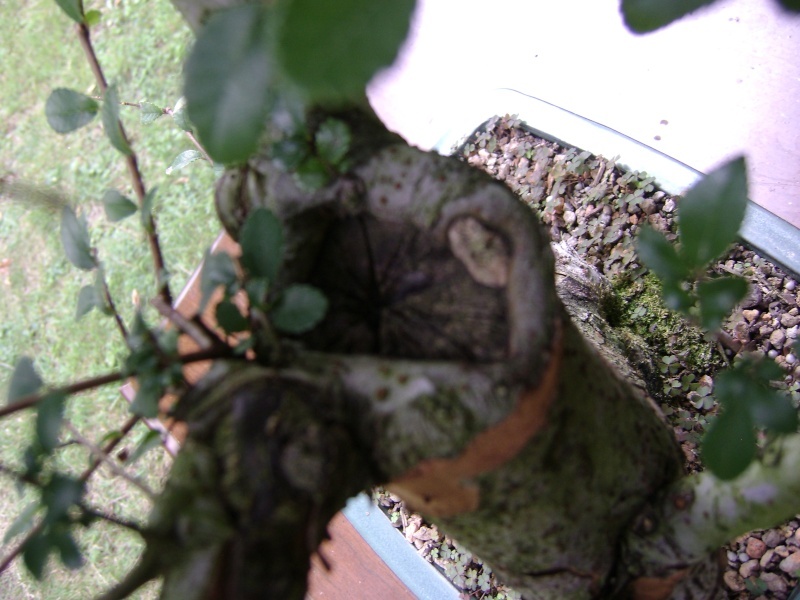 the only things that im not to fond of is that it looks like it was cut in half at one point with no paste to heal the wound (you can see the heartwood) also it was wired poorley into the pot and you can see wires on both sides of the trunk. ill post some more pics if i have time if not ill post some of the "after" pics. The tie-down wires just about always show, since that is about the last thing you do after the tree is potted. You will see when you get your first potting lesson. It doesn't matter now, since you will not be showing your tree yet. 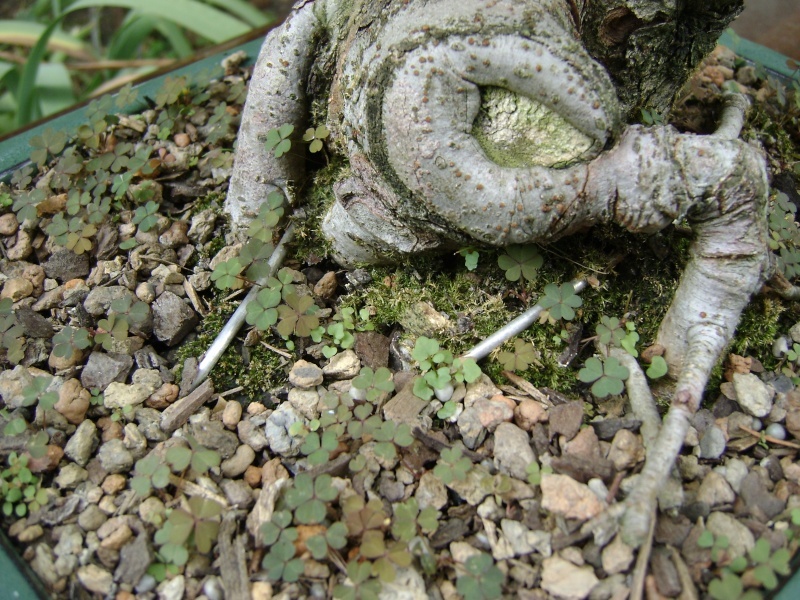 After it is trained and repotted, you will check shortly before you want to show it, & see if it wobbles. Elms root in pretty fast. You may be able to cut off one or both wires before you show it. But don't worry if you can't. They are allowed in a show & you can partly hide them with moss. thank you very much for that bit of information. it seems no matter how much i read, i just need to dive in and know that im gona kill some trees . i think that is one of my biggest problems i HATE the idea of killing trees. i even water friends house plants when im over if the plant needs it. Behind every green thumb is a large pile of dead bodies. The biggest experts kill trees all the time. In order to make a perfect three-egg omelet, you need to break at least 16 eggs. im sorry it was Mississippi. i am really greatful for the advise thank you very much. this bonsai club is great and everyone has been so nice. here is the info from where i got the tree. mine is the $150 dollar chinese elm. How was the show at Hollow Creek? Did you have a good time? Did you work on the elm? The trip is this saturday (aug.21) and i will be sure to post pictures. Im not to sure what we are going to try to do as it being this late in the season Dave Paris is going to working on our trees. Thanks for asking though. Oops! Well, have a good time this weekend. You will be able to prune and wire (if needed) your elm.